If you have a slow cooker (or "crock pot") and enjoy tortilla soup, here's a good recipe to try out. Grill the chicken breasts. Shred them with a fork and knife. Combine all ingredients except cheese, sour cream, and chips. Cover the pot and cook on low for 8 to 10 hours. Enjoy the soup, adding chips, sour cream, and cheese to taste. What I like about this recipe is that it's incredibly simple, involved grilling (always fun), and takes no more than about 15 minutes to get going. You're then left with enough soup for four adults (or two for two days in our case). Personally, I skip the cheese and sour cream. The soup itself is excellent with some chips added in. What brand of Hot Sauce? Sounds like a Californicated Mexican dish! yum! this is my favorite soup -- thanks for sharing! I feel silly asking, but I see no water in there; is there really enough residual liquid for a soup? Awesome soup. The basis for the recipe was one that requires ingredients that are mostly pantry items. Everyone who has tried it has enjoyed it. Gee, I was so excited about sharing that I forgot to mention that The tortilla soup recipe looks good, but I must agree with Richard that there appears to be very little liquid. Missing some chicken broth perhaps? Forgot the broth while copying it into my editor. Added in now. Thanks! As a side note, a blender is a surprisingly good and thorough chicken breast shredder. pulse 1/4 breast at a time. 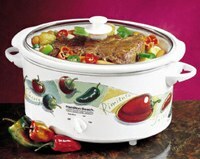 Oh, how I do love my slow cooker (best thing ever for the busy trying-to-be-less-fat guy). I make something similar to your recipe. A couple of things I've discovered -- if you're really pressed for time, blanch the breasts in boiling water instead of grilling. For recipes like this, the spices are sufficient to make the chicken less boring. Also, when shredding chicken, let it cool and use your hands instead of a knife. It will taste better, trust me. I also love the ease of crock pot cooking - just put stuff in, come back in several hours and its done. I have found with chicken tortilla soup that adding some lime juice is very yummy - at least a teaspoon. Thanks for sharing this - we tried it out today and it was easy to make and excellent (if I do say so myself!). Oh!! It's my favorite recipe!! i really love tortilla. i ought to TRY this! thanks.